Vincent Nunes “Move, Move, Move” is a CD of fun songs! You are here: Home / Media Reviews / Vincent Nunes “Move, Move, Move” is a CD of fun songs! Looking for music that will make your little ones want to dance and move? 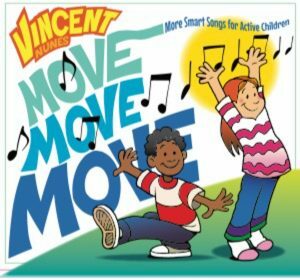 Vincent Nunes just released his 10th recording of original music for children, entitled, “Move, Move, Move”. I had the opportunity to check the CD out for myself and highly recommend it for young children because it is fun! I also like that young children will have fun moving to these songs! 1. Celebrate Today, Today 2. Why Do I Move My Feet 3. (I Wish I Could) Fly Like My Dog 4. There’s Always Something in My Way 5. ABC Jones 6. I Wanna Bounce 7. Hello, Goodbye, Hello 8. Rock Star 9. Walking a Tight Rope 10. If You Can Dance, Dance 11. I Love the Moon …plus a “hidden” bonus song! Self Disclosure: I received a free CD to facilitate this post. Images were also provided. No other compensation was received and I only feature media that I highly recommend. Always agreed that music is a great stimulus for children and parents should provide this with their culture.